The Student Gradebook feature allows instructors to view the gradebook in the same way that students view it in Moodle. Another benefit of the Student Gradebook is that it can display a single student's grades while protecting the privacy of other students' information. 1. Log into Moodle and select your desired course. 2. On the left of your screen, under the Administration block, select Grades. 3. Select Student Gradebook in the drop-down menu at the top left. 4. 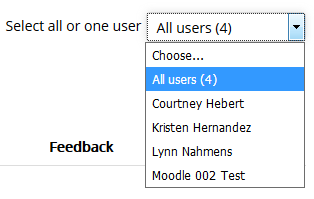 Select all users or a specific student from the drop down menu, which is located at the top right of the page. 5. The student gradebook view will appear for the selected user or users.